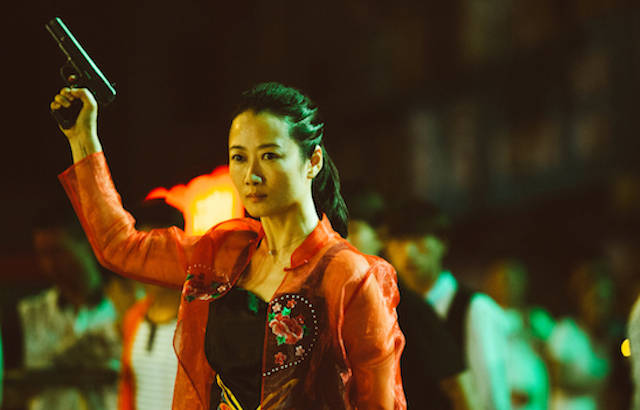 Writer/director Zhangke Jia constructs a cinematic soap opera, using striking visuals to communicate the “love story,” and defines the story through the violence of everyday survival in the organized crime setting. The main couple have a grudging respect for each other rather than overt love, and in a sense it is assessing what love means through the filter of survival. In a luckless and loveless time, what does being together mean? The title refers to volcanic ash, a pure whiteness because it has burned completely, which symbolizes the couple’s story. The two principal actors have a stoic demeanor which is counter to romance, which makes Qiao’s obsession hard to fathom. When she finds out that a rival has taken her place during the years in prison, she is more blank than upset. What is fascinating about her, in the way she is drawn, is how she survives. When she needed to eat, she found a wedding banquet. When she had to get cash, she came up with a clever con against a rich guy. In a survival sense, she understands the game. Universally, couples are couples everywhere, and the quirks and particulars of each relationship is as different as a fingerprint. If there is anything that “Ash” teaches us, it’s that the private connections between lovers can never be dismissed or explained from outside observations.